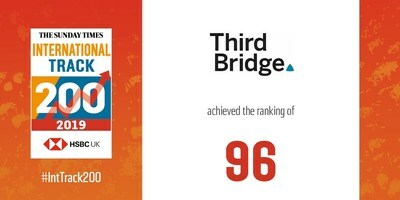 LONDON, Feb. 8, 2019 /PRNewswire/ -- Third Bridge, a leading research firm providing unique human insights into companies and markets to inform investment decisions, has again been recognised as one of Britain's 200 companies with the fastest-growing international sales by The Sunday Times HSBC International Track 200. The inclusion marks the second time Third Bridge has been honoured with the distinction. The list recognises and celebrates Britain's private companies with the fastest-growing international sales over their latest two financial years. It is compiled by Fast Track and published in The Sunday Times each February. "Our three largest markets are the US, China and here in the UK, and this recognition is a tribute to the hard work of our team and clients to accelerate our global growth," said Emmanuel Tahar, co-founder and chief executive officer at Third Bridge. "Although we're headquartered in the UK, we consider ourselves a global company and look forward to continued investment in growth both domestically and internationally." Third Bridge is an independent research company that provides strategy consultants, private equity firms, hedge funds, and credit funds with the key information they need to make informed investment decisions. We do this by providing unique human insights into companies and markets through primary research and consultations with specialists. Our team of over 800 employees is spread across eight offices in three continents, providing a range of complementary services to a global client base.